If you love to watch wildlife in its natural surroundings, you’ll be glad you have a rental car. Whether you’re driving a sedan, van, Jeep or convertible, you have the option of driving out to the many island beaches or parking along cliffs to enjoy whale watching on your own time schedule. With a rental car you are free to go when you want, and to stay out as long as you wish. A pair of binoculars and a camera with telephoto lens make your whale watching experience even more rewarding. Humpbacks are most popular of the more than half dozen Baleen whales that migrate to our islands. The best months to spot Humpbacks are December to April, although they may be spotted as early as October and into May. 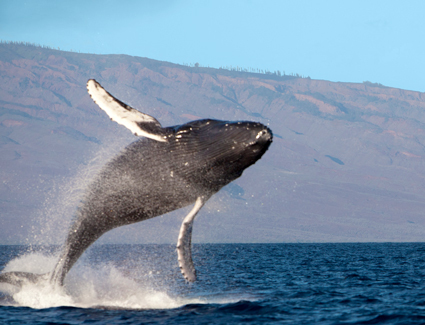 Humpbacks migrate annually from Alaska to breed and give birth in the warm, shallow waters of Hawaii. You’ll know you’re looking at a Humpback when you see a large, stocky body with a big hump on its black back. Watching whales and dolphins in the Hawaiian Islands is a year-round activity. Boat tours are wonderful, and we recommend them. Be sure to choose a company known to observe legal protocol of remaining 100 yards from whales and always approaching them from behind, not head-on. And, for the many island visitors who wish to spend their travel money elsewhere or don’t want to experience rolling seas beneath them for 2 to 4 hours, take advantage of a rental car to get to the best island whale watching spots. Your concierge can suggest whale watching locations to enjoy from the comfort of your rental vehicle.